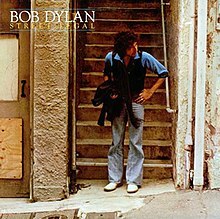 Street-Legal is the 18th studio album by American singer-songwriter Bob Dylan, released on June 15, 1978 by Columbia Records. The album was a departure for Dylan, who uses a large pop-rock band including female backing vocalists. Before work began on Street-Legal, Dylan's personal life underwent a major change. In February 1977, Dylan spent several days at Gold Star Studios where Leonard Cohen was recording a new album, Death of a Ladies' Man, with Phil Spector and Allen Ginsberg. After one session where Dylan and others indulged in a substantial amount of alcohol, Dylan returned to his Malibu home with an old friend of Cohen's, a woman named Malka. According to a declaration by Sara Dylan's legal representative (publicly released in March 1977), "On February 22nd...[Sara] came down to breakfast and found Dylan, the children, and a woman named Malka at the breakfast table. She said that it was then that Dylan struck her on the face and ordered her to leave." It's unclear whether this statement is true; any additional context or information was sealed by Judge Raffedie. (Judge Raffedie also sealed Dylan's response to his ex-wife's allegations; the order was given before Dylan's response was filed.) The divorce was quickly settled, becoming final in June 1977, with apparently little effort at reconciliation. Sara would receive initial custody of the children. In the meantime, Dylan was still editing Renaldo and Clara, an ill-fated film that was shot during the fall of 1975, when Dylan was on the first leg of a tour with the now-defunct Rolling Thunder Revue. With the summer approaching, Dylan took a break from the film and returned to his farm in Minnesota, where he was accompanied by his children and Faridi McFree, with whom Dylan had started a relationship. There he began writing a new set of songs, including "Changing of the Guards," "No Time to Think," and "Where Are You Tonight?" At least six of the nine songs ultimately included on Street-Legal were written during this time. His work was disrupted on August 16 when news broke out that Elvis Presley had passed away at 3:30 p.m. at Baptist Memorial Hospital in Memphis, Tennessee. "I went over my whole life," recalled Dylan. "I went over my whole childhood. I didn't talk to anyone for a week." Later that fall, another custody battle emerged when Sara sought permission from the court to move to Hawaii with the children. It was a major distraction at the time, as Dylan was planning a world tour, his first in twelve years, and the stage was already set when Dylan signed a five-year lease to an old three-story building on the corner of Ocean and Main in Santa Monica, California. Dubbed 'Rundown,' the building was soon converted into a rehearsal space and studio, and by September, he had already staffed it with Joel Bernstein and Arthur Rosato, two engineers who were originally part of Dylan's road crew in 1976. Before rehearsals could begin, Dylan had to assemble a band, and he quickly contacted several musicians, including former Rolling Thunder Revue members Steve Soles, David Mansfield, Rob Stoner, and Howie Wyeth. Stoner recalls, "I thought the Hard Rain thing was the last I'd ever hear from Bob...Then suddenly I get this call - I think Bob called me up personally...and asked me to bring Howie, and a couple of other people, to L.A. to 'just try some things out.'" Soles, Mansfield, Stoner, Wyeth, pianist Walter Davis, Jr., and percussionist Otis Smith arrived in late November and early December. Even with the players assembled, Dylan was not ready to rehearse as the custody battle over his children and the imminent release of Renaldo and Clara drew most of his attention. (He was still editing Renaldo and Clara up to the very last minute.) "Bob kept us sitting around for a week or two," recalls Stoner. "He just never showed up...and [when he finally] drops in, he's distracted...He was really [stressed out]. He was always bummed out. He was chain-smoking and he was really in a bad mood. He was short with people. It just wasn't working out." Eventually, a settlement in his custody battle was reached in late December, ensuring that his children would remain in California where Dylan would have access to them, but in exchange, Dylan had to sign an agreement promising never to see McFree again. Fallout from the custody battle would keep Dylan and Sara from reaching amicable terms for several years. Meanwhile, Renaldo and Clara was released to some of the worst reviews of Dylan's career. The negative reaction clearly irritated Dylan, but with the film finally released and his legal matters settled, Dylan was ready to rehearse. Sessions soon began in earnest, but on December 26, Dylan followed the day's rehearsals with a preview of his next album; playing just the piano, Dylan ran down his new batch of songs to Stoner, Soles, and Bernstein, many of which were written that summer at his farm in Minnesota. As rehearsals went underway, it became clear that they weren't "picking up where the Rolling Thunder Revue left off," recalls Mansfield. "I brought my steel guitar and I had it in rehearsal and every time I'd go to start unpacking it, Bob would go, 'We don't need that.' All of a sudden the instrument that I played all over the place in the previous band, he didn't want to see it, let alone hear it." One component from the Rolling Thunder Revue left by his own choice. Howie Wyeth was struggling with his own heroin addiction at the time, recalling, "I knew I couldn't get high once we'd left...I realized I was either gonna get busted or I'd end up being tortured to death. So I literally had to just tell Bob one night, 'I can't do it.' That was terrible. He had his own problems. He felt bad that I wasn't gonna do it, and he called me up when I got home to New York and said, 'Are you sure?'" After auditioning a number of drummers ("maybe ten or a dozen" by Bernstein's estimates), Dylan replaced Wyeth with Denny Seiwell, who briefly played with Paul McCartney and Wings. When rehearsal was held on December 30, the band now included Stoner, Mansfield, Soles, guitarist Jesse Ed Davis, and singers Katey Sagal, Debbie Dye Gibson, and Frannie Eisenberg. This rehearsal was mostly dedicated to rearrangements of classic Dylan compositions, many of which drew heavily on the adult-contemporary pop of the time (Wayne Newton, Barry Manilow, Marvin Hamlisch). As biographer Clinton Heylin writes, "[Dylan] began to impose a grander vision on whatever sound the Revue veterans had initially conceived. With his love of fatback R&B, it should have come as no surprise that he hankered after a band with a saxophone player and some female singers...the band he assembled in the two months before the 1978 world tour shares many similarities with the big band he had attempted to impose on Desire. The girls/sax/keyboards combination also reflected elements of the extravagantly presented shows Presley had been playing in the 1970's." In the meantime, Seiwell was let go; during his brief stint with Wings, he and the rest of Wings were busted for drug possession in Sweden, prompting Japanese officials to deny him an entry visa. A number of auditions were quickly arranged, and according to Stoner, they "settled" on former King Crimson drummer Ian Wallace. Though Wallace's drumming would become problematic ("The man had a beat like a cop," recalls Stoner), time had run out as the tour was almost upon them. The Danish/American guitarist Billy Cross was also brought in, and eventually Dylan's touring band was solidified with Cross, Wallace, keyboardist Alan Pasqua, percussionist Bobbye Hall, and saxophonist Steven Douglas, Mansfield, Stoner, Soles, and the back-up singers. In the final two weeks of rehearsals, Dylan began settling on new, tour arrangements for his classic, earlier recordings. Rob Stoner recalls, "a telegram arrived from the Japanese promoter, and in it he had a manifest of the songs he expected Bob to do on this tour. In other words he was a jukebox, he was playing requests. We don't want you coming here and doing like your new experimental material, or getting up there and jamming." As Heylin writes, "though the idea of a big band had always appealed to Dylan, the reality was a whole series of new arrangements, to make each song different and to highlight the band's demonstrable versatility...Often these arrangement ideas came from the band. As Stoner observes, when they put these arrangements to Dylan, 'Sometimes he'd like it and he'd use it, and other times he'd say, Forget it.'" The band flew to Japan on February 16, 1978, and the tour drew considerable praise from the audience and press, in both Japan and Australia. Later documented on Bob Dylan At Budokan, this tour was marked by bold, new arrangements of Dylan's classic recordings. During the course of these two-hour plus shows, Dylan often recast familiar songs in a more 'professional,' contemporary guise. However, some of the band members, including Stoner, were not entirely satisfied with Dylan's new sound. "He had in mind to do something like Elvis Presley," recalls Stoner. "That size band and the uniforms...he wasn't very sure about it, which is why he opened way out of town. I mean, we didn't go any place close to Europe or England or America [for] forever, man...and I don't blame him. I think he knew, subconsciously, he was making a big mistake." The tour ended on April 1 at the Sydney Fairgrounds in Australia. When it was over, Stoner informed Dylan that he was leaving the band. Dylan was planning to record his next album upon returning to Los Angeles, but with Stoner gone, Dylan hired a new bass player, Jerry Scheff. Like Douglas, Scheff was a well-known player in Presley's touring band of the early 70's. With Scheff replacing Stoner, Dylan began recording his new material with his touring band. Sessions were held at Rundown, with Dylan renting a mobile truck to record the proceedings. (The mobile truck was equipped with 24-track capabilities, something his studio did not have.) "I didn't want to do it there," Dylan later recalled. "[I] couldn't find the right producer, but it was necessary to do it. So we just brought in the remote truck and cut it, [and] went for a live sound." Dylan would ultimately settle on Don DeVito as his producer, even though he was dissatisfied with DeVito's work on Desire. Dylan already had a European tour scheduled for June, but he still had enough time to record his album; over the course of just four days, Dylan would record nine of his own compositions. Dylan knew exactly which songs he wanted to record, and though three songs written by Helena Springs were also recorded during these sessions ("Coming from the Heart," "Walk Out in the Rain," "Stop Now"), there is no indication that these songs were ever serious contenders for the album. Though the sessions lasted only four days, there were still a number of problems. "The biggest problem...was how it was recorded," recalls Mansfield, "with Bob getting impatient with the engineering assistants...baffling and checking levels and getting sounds in sync...and the recording crew just having to scramble to get mikes into place, and get something on tape, while we were playing the thing the few times we were gonna play it. Consequently, the music is very poorly recorded, but that stuff sounded marvelous in the room, tons better than Budokan. It really was sort of like Bob Dylan meets Phil Spector in the best way...as if it had [just] been recorded so the instruments sounded full and well-blended." Following the twin successes of Blood on the Tracks and Desire, Street-Legal was another gold record for Dylan, peaking at No. 11 on the U.S. Billboard charts, making it his first studio album to miss the U.S. Top 10 since 1964. However, it became his best-selling studio album in the UK, reaching No. 2 on the charts (his highest position in eight years) and achieving platinum status with 300,000 copies sold (the only other Dylan album to do this was The Essential Bob Dylan). As opposed to previous albums, the outtakes for Street-Legal are few in number. Only three additional songs were recorded for the album, of which none have seen release. There are two takes of "Stop Now", sounding very much like an additional "Street-Legal" song, in circulation. The Searchers would record "Coming From The Heart (The Road Is Long)" and Eric Clapton would release "Walk Out In the Rain" on his album Backless, which also included another song written at this time, "If I Don't Be There By Morning." When Street-Legal was released, it was dismissed by the American press. Crawdaddy! critic Jon Pareles remarked that "Dylan still needs a producer," but others found fault with both the songs and the performances. Greil Marcus criticized the singing as "simply impossible to pay attention to for more than a couple of minutes at a time" and accused "Is Your Love in Vain?" of sexism, claiming Dylan was "speak[ing] to the woman like a sultan checking out a promising servant girl for VD." Robert Christgau would later call it a "horrendous product," and in his original review, he gave it a C+, writing that Dylan "sounds overripe, too in love with his own self-generated misery to break through the leaden tempos that oppress his melodies, devoid not just of humor but of lightness." In the UK, reviews were positive, with Michael Watts of Melody Maker proclaiming it Dylan's "best album since John Wesley Harding". NME's Angus MacKinnon hailed it as Dylan's "second major album of the 70s." In contrast to the record's still mixed reputation, Q Magazine has given the album a 5 star rating on re-release on two occasions, pointing out that the original muddiness of the production was part of the reason the record has so long been critically overlooked. When Dylan embarked on his European tour, he would be greeted by a generally warm audience reception, and his single, "Baby, Stop Crying" (the lyrics of which were allegedly inspired by Robert Johnson's "Stop Breaking Down"), would chart in the top ten throughout Europe, and reached number 13 on the UK Singles Chart with the album peaking at number 2 on the album chart. In the US, however, the single failed to crack the top 100 and the album itself peaked at number 11, ending Dylan's string of number 1 albums in America until 2006's Modern Times. When Dylan continued his tour in America, it would be derided by the American press as the Alimony Tour and later the Vegas Tour, much to Dylan's chagrin. Many years later, even Street-Legal's most ardent admirers would admit some flaws in the album, finding most fault with the production. "Street-Legal would be the first in a long line of song collections whose failure to be realized in the studio would lay a 'dust of rumors' over Dylan as an abidingly creative artist that he has never been able to fully shake," writes Heylin. Don DeVito – "Captain in Charge"
^ Stephen Thomas Erlewine (1978-06-15). "Street Legal - Bob Dylan | Songs, Reviews, Credits, Awards". AllMusic. Retrieved 2013-09-15. ^ "Bob Dylan: Album Guide". rollingstone.com. Archived from the original on September 18, 2013. Retrieved February 20, 2017. ^ Desire - Bob Dylan > Charts & Awards > Billboard Album at AllMusic. Retrieved 29 December 2004. ^ "Bob Dylan" (in German). Charts.de. ^ "Official Albums Chart Top 60 – 02 July 1978 - 08 July 1978". Official Charts Company. ^ "Canadian album certifications – Bob Dylan – Street Legal". Music Canada. ^ "British album certifications – Bob Dylan – Street Legal". British Phonographic Industry. Select albums in the Format field. Select Platinum in the Certification field. Type Street Legal in the "Search BPI Awards" field and then press Enter. ^ "American album certifications – Bob Dylan – Street Legal". Recording Industry Association of America. If necessary, click Advanced, then click Format, then select Album, then click SEARCH.